Ventas (VTR) was founded in 1983 and is the second largest medical REIT in the country, with nearly 1,200 properties in the U.S., U.K., and Canada. The firm's property portfolio consists primarily of seniors housing communities, medical office buildings, life science centers, and inpatient rehab and long-term acute care facilities. The largest source of Ventas's cash flow is derived from senior housing properties, which are run by third-party operators under a triple-net lease arrangement (tenant pays all maintenance, taxes, and insurance), as well as by the company itself. Over the past few years, Ventas has embarked on an aggressive portfolio evolution in which it's been selling off assets in struggling industries (skilled nursing and parts of senior housing) and investing more heavily into medical offices, acute care centers, and life sciences buildings. 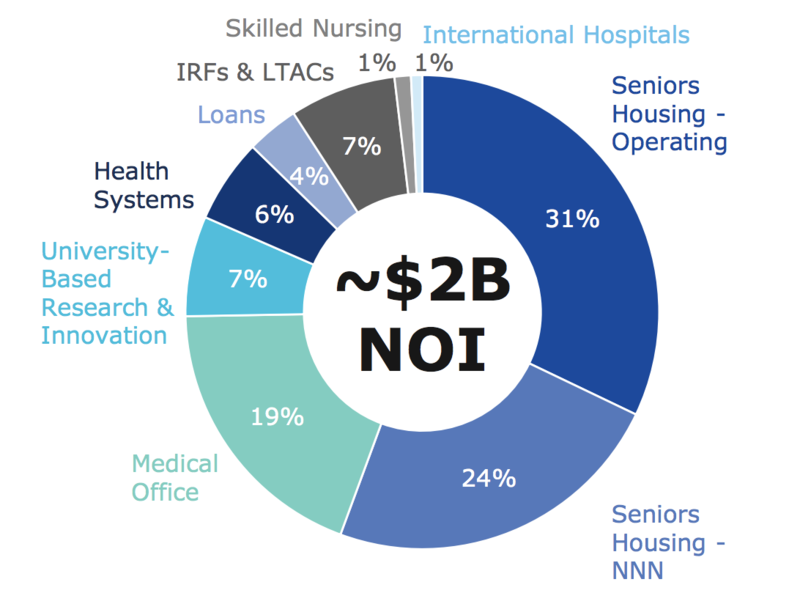 While senior housing still represents a majority (about 55%) of net operating income, the REIT's exposure to more stable and faster-growing industries such as medical office buildings, R&D facilities, and outpatient facilities connected to leading health systems has risen to 32% of profits. Ventas's medical office buildings are attractive because 97% of them are affiliated with university or regional hospital networks, and 85% of rent is from investment grade clients. Due to switching costs (doctors don't want to change locations that patients are used to), occupancy rates tend to be high as do retention rates. The research facilities Ventas leases out enjoy high occupancy rates as well (north of 95%) since the REIT partners only with the strongest counterparties, 75% of which have AA- or higher credit ratings. Combined with its long-term lease agreements, which have an average of nine years remaining, this part of the business is a reliable cash generator. Adjusted for its 2015 spin-off of Care Capital Properties, Ventas has paid uninterrupted dividends (with no cuts) for 18 years and raised its annual dividend for eight consecutive years. The underlying long-term investment thesis for almost any medical REIT is that strong demographic trends, including the aging of the population, will greatly increase the need for medical services and medical properties over the coming decades. 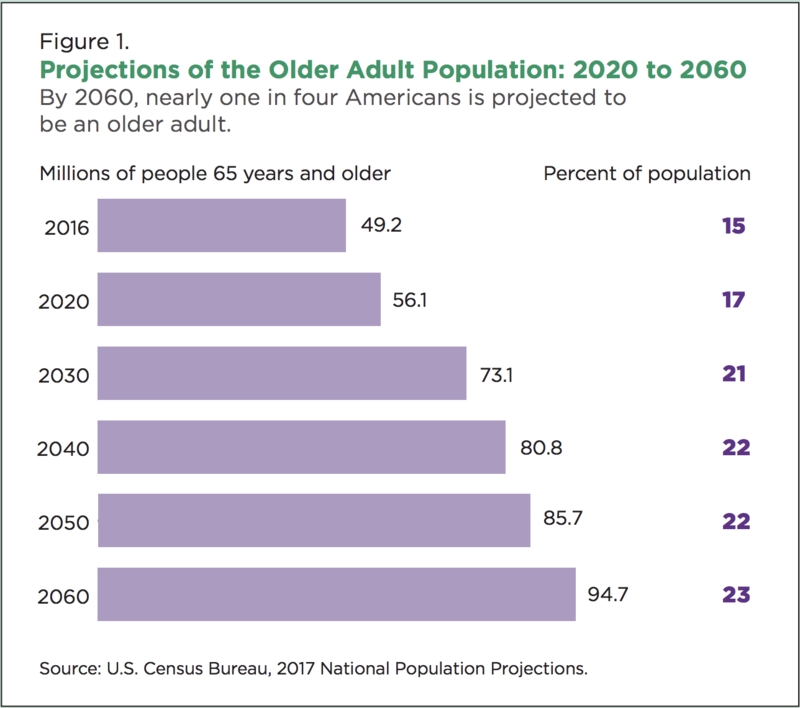 In fact, the U.S. Census Bureau projects that by 2060 nearly one in four Americans will be over the age of 65, up from 15% in 2016. As a result, U.S. healthcare spending is projected to rise by 5.5% per year from 2017 through 2026, resulting in healthcare accounting for 19.7% of GDP (up from 17.9% in 2016) according to the Centers for Medicare & Medicaid Services. Similarly, Ventas notes that the American population of seniors age 75 or older is growing seven times faster than the overall population, resulting in opportunities for medical REITs to consolidated the fragmented $1.5 trillion U.S. healthcare real estate market and fuel years of potential growth. Of course, just because an overall market is large and growing doesn't mean that investors can just blindly invest in it. A key to Ventas's appeal is the company's exemplary management team, headed by longtime (since 1999) CEO Debra Cafaro. Over her 19-year tenure as CEO, Mrs. Cafaro has helped deliver a total return in excess of 2,300% for investors. Put another way, under her watch, Ventas's market cap has blossomed from $200 million at the beginning of her tenure to more than $20 billion today. Not surprisingly, Harvard Business Review has named Mrs. Cafaro as one of the top 100 best performing CEOs in America no less than five times in its annual reviews. Ventas's management team is considered by many to be arguably the best in the industry. One supportive factor is the firm's proven ability to adapt to the rapidly-evolving medical industry through a series of well-timed strategic shifts in Ventas's business model. For example, Ventas was the first large medical REIT to take advantage of the 2007 REIT Investment Diversification and Empowerment Act (RIDEA) via its 2007 acquisition of SunRise Senior Living REIT. Before RIDEA, the only way it was legal for REITs to own certain medical properties, such as skilled nursing facilities and senior housing, was under a triple net lease business model, which basically meant they were nothing more than landlords with no ability to share in any profits from rising occupancy rates or average revenue per occupied room (REVPOR). After RIDEA, Ventas was able to aggressively enter the senior housing space and actually partner up to operate its own properties. This business now accounts for just over 30% of the firm's total net operating income. Most of these properties are located in the country's largest and most affluent markets. In fact, 65% of this division's operating profits are derived in coastal markets with relatively high barriers to entry (often due to zoning restrictions). Median household incomes in these regions are 40% above the national average, and median home values are twice the national average as well. In 2010 Ventas made made another wise strategic move when it broke into medical office buildings (a $200+ billion market) by acquiring Lillibridge Healthcare Services for $350 million. Compared to senior housing, these properties generally have far higher occupancy rates and more premium rents due to their key locations on medical center campuses and near hospitals. However, management has demonstrated a willingness to prune weak, riskier areas of the firm's portfolio as well. In 2015, Ventas was the first of the big three medical REITs (the others being Welltower and HCP) to start shifting out of the troubled skilled nursing facility industry, via its $4 billion spin-off of Care Capital Properties (CCP). Later, in 2017, the company struck an agreement with Kindred Healthcare (KND), one of America's largest skilled nursing facility operators, to sell 36 of its facilities in exchange for $700 million. Importantly, besides reducing risk, the CCP and Kindred exits also provided Ventas with capital to further target far healthier and faster-growing markets, such as medical office buildings and life sciences properties. For example, in 2015 Ventas bought Ardent Health Services ($1.8 billion) and in 2016 acquired Wexford Life Science ($1.5 billion) in order to gain stronger exposure to acute care hospitals and medical research facilities. These properties can have occupancy rates as high as 97% and are rented out to the world's leading medical research universities, such as Yale, Duke, Washington University, and Brown. In fact, among its major peers, Ventas has been among the most aggressive in evolving its portfolio into medical office buildings and life sciences, with more than $7 billion invested over the last seven years. You can see that the REIT's rentable square footage for university-based research has significantly increased over the past decade and is leased out to some of the premier research universities in the country. Thanks to the appeal of this business, Ventas says that life sciences facilities, specifically those associated with leading research universities, are its top capital allocation priority. Therefore, investors should expect the firm to continue making property acquisitions in this space, improving Ventas's portfolio quality in the years ahead. A key reason why Ventas can aggressively target these promising medical industries is the firm's low cost of capital. 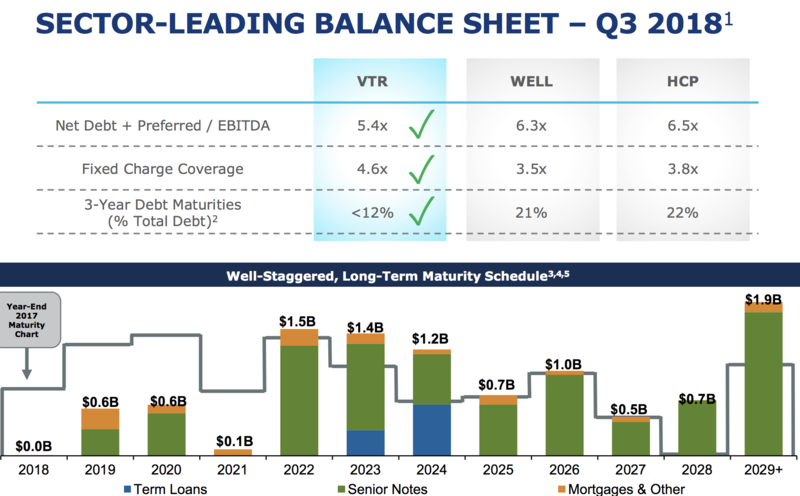 Specifically, Ventas maintains one of the strongest balance sheets of any REIT, with more conservative leverage ratios and a favorable debt maturity schedule. As a result, Ventas earns a top credit rating (BBB+) in the industry which allows it to access debt at very cheap levels to profitably fund its ongoing growth and diversification efforts. While the firm's adjusted funds from operations payout ratio has crept up in recent years, driven by asset sales, the improved quality of Ventas's property portfolio, cash flow stream, and balance sheet suggest its dividend should remain on solid ground in all manner of economic and interest rate environments. Overall, Ventas has a portfolio of diversified healthcare properties run mainly by best-in-class operators who should collectively benefit from favorable demographic trends over the coming decades. Management has shown capital allocation skill since Ventas went public in 1999, and the large and fragmented nature of the healthcare real estate market provides numerous opportunities for continued growth. But while Ventas appears to be one of the strongest players in this important industry, there are nonetheless important risks to keep in mind before investing. As impressive as Ventas's growth has been, investors shouldn't necessarily expect similar results going forward, even with the industry's demographic tailwinds. Numerous risks are created by the evolving medical industry, which is going through some of its own growing pains. For example, while the long-term aging of the U.S. population seems likely to generate strong growth in medical demand and spending in the coming decades, it has not yet helped industry fundamentals in the senior housing space. Senior housing operators are combatting supply growth (developers preparing for the building demographic wave) and rising wages due to the tight job market (labor accounts for 60% of an operator's expenses), which has pressured rent growth, industry occupancy rates, and rental coverage ratios. As a result of slowing rent growth, a modest dip in occupancy rates, and higher labor costs, in 2018 Ventas's senior housing operating properties recorded a low single-digit decline in same-store net operating income growth. However, senior housing fundamentals could finally be on the verge of improving as well. Ventas observed that new senior housing construction starts in its markets fell to their lowest level management has observed in five years. 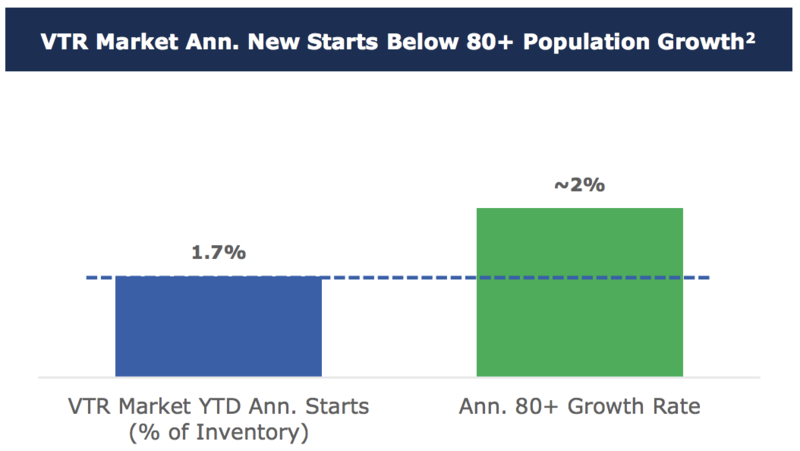 As a result, through the first three quarters of 2018 growth in new construction starts trailed growth in the population of people age 80 or older. The National Investment Center for Seniors Housing & Care (NIC) reported positive news as well. Specifically, the organization noted that the fourth quarter of 2018 registered "the highest increase in occupied senior housing units since NIC began to report the data in 2006." Hopefully the worst is behind Ventas as it relates to senior housing, which will continue to account for the majority of the REIT's cash flow for the foreseeable future even as management acquires more medical office buildings and research facilities. Fortunately, even if trends remain unfavorable, the firm's triple-net same-store senior housing portfolio has a reasonable rental coverage ratio (operating cash flow/rent) of about 1.2. In other words, most of its tenants should be able to continue honoring their leases despite the industry's current challenges. However, about 16% of the REIT's triple-net income is accounted for by senior housing operators with rent coverage ratios below 1.2, meaning that in the future Ventas may have to continue renegotiating leases with struggling tenants and possibly divest underperforming facilities. While that capital will ultimately be reinvested into stronger properties, including in the medical office buildings or life sciences industries, such tenant issues can result in slower cash flow growth for several years. In fact, Ventas's adjusted funds from operations per share peaked in 2014 and has moderately declined since then (which is why dividend growth has slowed considerably) due to management's need to adapt the property portfolio to deal with the challenges facing skilled nursing facility and senior housing operators. Pruning continued in 2018 with Ventas selling $1.5 billion in properties in the first nine months of 2018 (mostly underperforming senior housing facilities), compared to just $467 million spent on new investments (mostly medical office buildings and life sciences facilities). Even with much slower dividend growth, the REIT's payout ratio has climbed from 73% in 2013 to over 80% in 2018. That's not an unsafe level, but it suggests Ventas's dividend can only safely grow in line with its rate of cash flow growth in the years ahead. Unfortunately, per Factset Research, the analyst consensus is for Ventas to record just 2.5% annual growth in adjusted funds from operations per share over the next five years. The sluggish pace of growth is due to a combination of challenges mentioned above (for senior housing), as well as the REIT's ongoing need to divest certain assets to continue adapting its portfolio (sales partially offsetting new investments). While such low expectations might prove overly bearish, it's safe to say that Ventas's days of high single-digit dividend growth are likely to remain behind it. Ventas is arguably one of the safest dividend payers in the health care real estate sector thanks to its diversified property portfolio, strong balance sheet, defensive business mix, conservative management team, and focus on private payers rather than government funding. However, keep in mind that due to the company's ongoing portfolio reshuffling, as well as some of the struggles in the competitive senior housing market, Ventas's dividend growth rate seems likely to be significantly slower over the next few years. The company still seems like a dependable income investment for a retirement portfolio, but investors should go in being fully aware of the industry's risks and some of the growth headwinds they could pose.